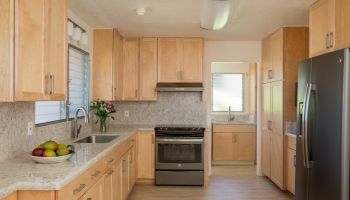 Looking to completely remodel their kitchen, one Kaneohe couple recruited the professionals at Homeowners Design Center (HDC), a full-service company which helped them find the exact outcome they were looking for in their kitchen remodel: an area that is highly functional, stylish and that also keeps in mind the best utilization of available space. But such a perfect finished product doesn’t happen immediately. It involves a process, beginning with HDC clearly defining the goals of its clients and helping them to determine what exactly their options are. Randall Omoto, designer at HDC, explains how the couple came in and were actually able to sit down with him and, utilizing the company’s 3D design software, were able to see a rendering of what the final kitchen remodel would feasibly look like before ever investing in a single product. “We were actually able to combine three small spaces into one big space,” Omoto says. “There was a living room hallway, a dining room and then the kitchen, which was a U-shaped kitchen that was kind of closed in. 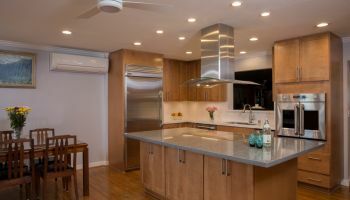 By removing the wall that separated the kitchen from the living room, we were really able to open up the space—taking it from an underutilized space to one where people could come in, be comfortable and interact with one another,” which was the goal of the kitchen remodel; making it the social center of the home, a popular trend in kitchens. 3D design software allowed the homeowners to see what the kitchen would look like before spending money on any materials. Omoto highlights one more integral aspect involved in the kitchen remodel. “There was also a large lanai door that really cut down the length of the kitchen, which the couple wanted to change.” Working with the couple’s desired specifications, HDC was able to exchange a smaller French door for the larger lanai door and minimize the entryway opening, which then enabled them to move the pantry over to the refrigerator, providing a bit more storage. This free flowing feel was very important to the couple, Omoto shares, as they desired to have their kitchen not only be a functional space but also one that lends itself readily to being an aesthetically beautiful—and social—environment. One of the common rules of kitchen remodeling: tall goes on the wall. After explaining the big picture of the kitchen remodel, Omoto gets down to specifics, sharing the details of how HDC really pulled the look together. When choosing countertop materials, natural stone (in two distinct color shades—one for the outer perimeter and another for the island) was chosen for its unique and one-of-a-kind character. Omoto explains that natural stone is a limited resource, making it unique in both look and design, and getting more limited every day, making it even more special and rare. There’s only so much natural stone you can pull out of the ground. Because natural stone is a limited resource, the uniqueness of stone makes it more special and rare. For the cabinets, which HDC was able to move up to the ceiling to open the space even further, Diamond brand Montgomery cherry cabinets in a stain called briarwood were chosen, infusing a lovely warmth to the kitchen remodel. They also complemented the the luxury vinyl flooring perfectly. “This [luxury vinyl flooring] is actually our number one seller, “ explains Omoto. “Not only does it appear so much like wood, it performs well, looks really nice, is not as expensive as wood, and is water-resistant.” The look is so convincing, he literally has customers touch and feel it to show them it’s not real wood. Cherry wood cabinets stained in briarwood infused the kitchen with a warm and inviting look and complemented the vinyl flooring. This kitchen remodel is another example of how Homeowners Design Center is able to help their customers flesh out their vision of their renovation by visualizing the things they know they want and plugging in the holes for the things that they think they might like or need, coupled with HDC’s knowledge and experience. To see more projects by HDC, or to see how they can help you with your kitchen remodel, just click on anywhere you see their name or “HDC” or on any of the photos above.